The Eye on Malaysia allows visitors to experience a 360-degree panoramic view of Kuala Lumpur during a 12-minute ride that goes 60 metres high. It offers a magnificent view of Kuala Lumpur and over 20 kilometres of its surroundings including KL Tower, Istana Budaya and Petronas Twin Towers. 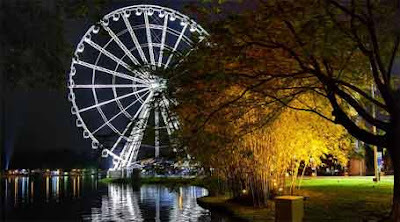 Similar in concept and style to the famous London Eye, the specially commissioned Eye on Malaysia is expected to be a hit among locals and tourists. There are a total of 42 gondolas comprising 39 units for the public, one for VIPs and two for disabled passengers. Each of the gondola on the Eye on Malaysia can carry up to eight persons. Titiwangsa Lake Gardens will be transformed into an audio-visual wonderland as four of the worldâ€™s largest and most high-tech water screens will show the faces and images of Malaysia combined with a fireworks display. The International WaterSky Spectacular runs at night with exciting shows commencing at 8pm daily. It features jet and water ski stunts and close proximity pyrotechnics to create a truly spectacular experience. Tickets are available at the sales counter in the Titiwangsa Lake Gardens. It costs RM 15 for adults and RM 8 for children aged 3 to 12 and senior citizens. The operating hours for the Eye on Malaysia are from 1000 to 2200 daily. hai, gd morning, can u send me the form for bringing a group of student to eye on malaysia again? i hvnt receive your email yet until now regurding the form for group visit. thanks. pls send me as soon as posible because we are going to visit eye on malaysia on 3 february 2008. Never mention hoe yto get there. eg. use monorail , where to stop. walk ow long. Along where?